The middle of August is when I first notice a dramatic spike in visitors to Essay Hell. A few students get that early start on their college application essays at the beginning of summer, but the majority seem to wait until now through fall. So if you are ready to hunker down and start, this might be your big chance. 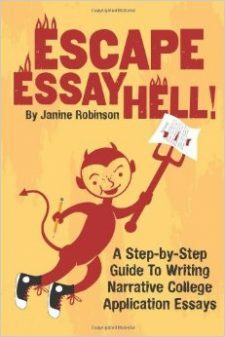 I would suggest that you first skim through some of the sample essays in my collection of student-written personal statements from Heavenly Essays. This will give you an idea of what a narrative essay is all about, and also spark ideas for your own topics. Good luck! No more excuses! Just start! I wonder if you still offer this deal? I just found your website today through a search and very interested in reading your books. Thanks. I just found your website, and have 12th grader. Is this 3 book offer ended already? I am very interested.